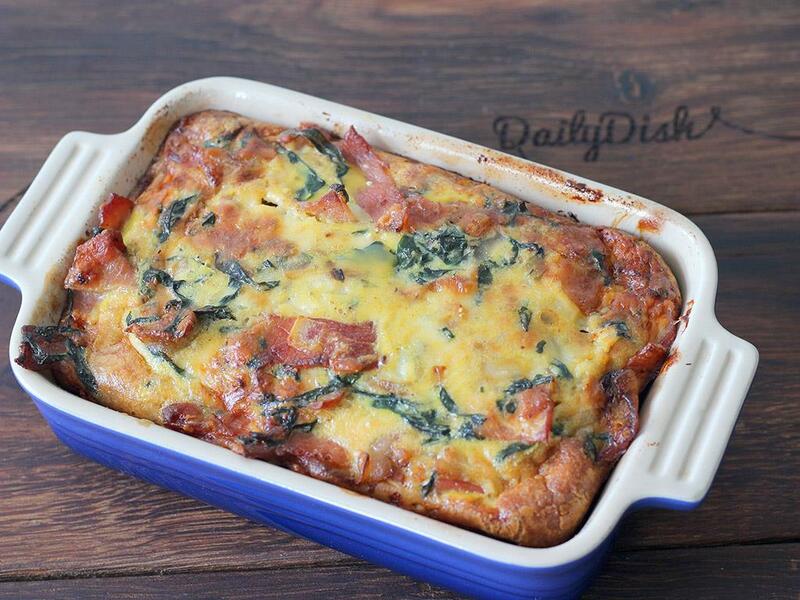 Made with our butcher's homestyle bacon, this is a filling and delectable crustless quiche. Only 5g of carbs per plate. Fry bacon in a dry pan over medium to high heat until done to your liking (we like it crispy). Heat butter and olive oil in large sauce pan over medium heat. Add onion and cook for few minutes until translucent. Turn the heat down and add the spinach, cook for about 3 or 4 minutes, stirring constantly, until spinach wilts. Remove from heat. Whisk together the eggs, cream, salt and pepper in a large mixing bowl. Add in cheese, onion and spinach mixture and the bacon and stir well. Butter a pie or quiche dish and pour in the quiche mix. Bake for 20 to 25 minutes until done. Check by inserting a knife in the centre - it should come out clean. Let the quiche rest for 5 minutes before serving. To serve, cut a slice of quiche for each plate.